Applications built in Pega 7 use the HTML5 Document Type by default, ensuring cross-browser and cross-platform compatibility, use of the latest HTML markup, and improved performance, among other benefits. In addition, Pega 7 includes a number of features that are available only to applications rendered in HTML5 Document Type. This article provides a quick overview of those features, as well as a summary of how to render your application in standards mode, and tips for a smooth upgrade to standards mode. Select DesignerStudio > User Interface >HTML5 Application Readiness to access a customized upgrade path to guide you in upgrading your application. See Upgrading an application to render in HTML5 Document Type. The following features and capabilities are available only to applications rendered in standards mode. Pega 7 includes a number of new layout formats that are flexible, responsive, and configured entirely in the skin. These layouts enable you to set responsive breakpoints and achieve responsive behaviors in your UI. Since these layouts are configured in the skin, they also provide a new level of separation between your content and its presentation, facilitating greater reuse and consistency throughout your application. Modal dialog styling — The implementation and CSS classes for custom modal formats differs, depending upon whether your application is rendered in HTML5 Document Type - standards mode or in quirks mode. For example, in HTML5 Document Type – standards mode, modal dialogs honor the design time width of the layout, while, in quirks mode, modal dialogs shrink to the minimum width and height possible. Drag and drop is not supported in modal dialogs rendered in standards mode. For applications rendered in Internet Explorer, verify that Compatibility View is disabled. 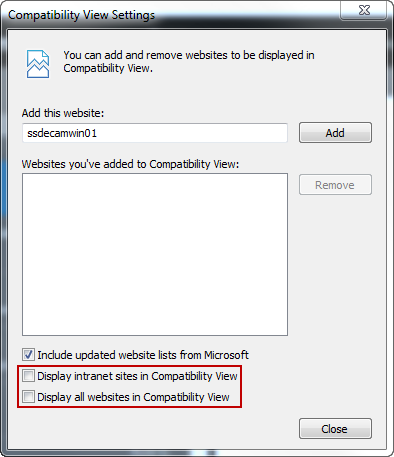 Note that by default, Compatibility View is enabled for intranet sites. Open Internet Explorer and select Tools > Compatibility View Settings. Make sure that your PRPC site does not display in the list of Websites you’ve added to Compatibility View. If it does, select your site in the list, and then click Remove.